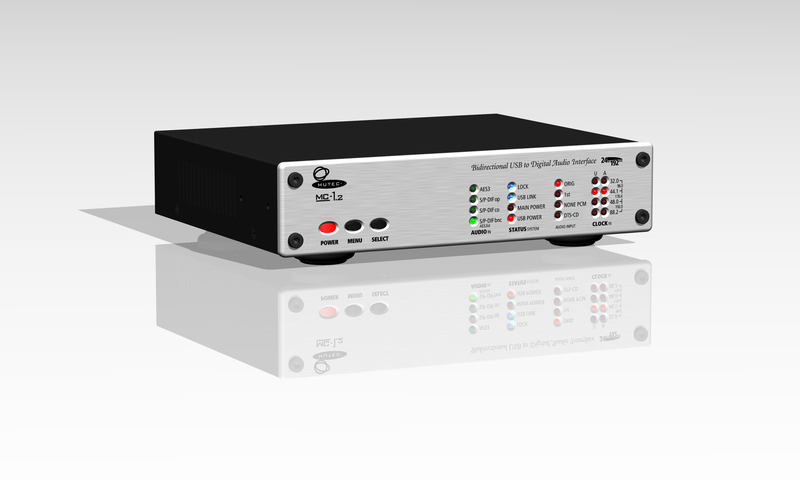 The MC-1.2 is a high-performance USB audio interface which converts from USB to AES3, AES3id and S/P-DIF signals, and vice versa. 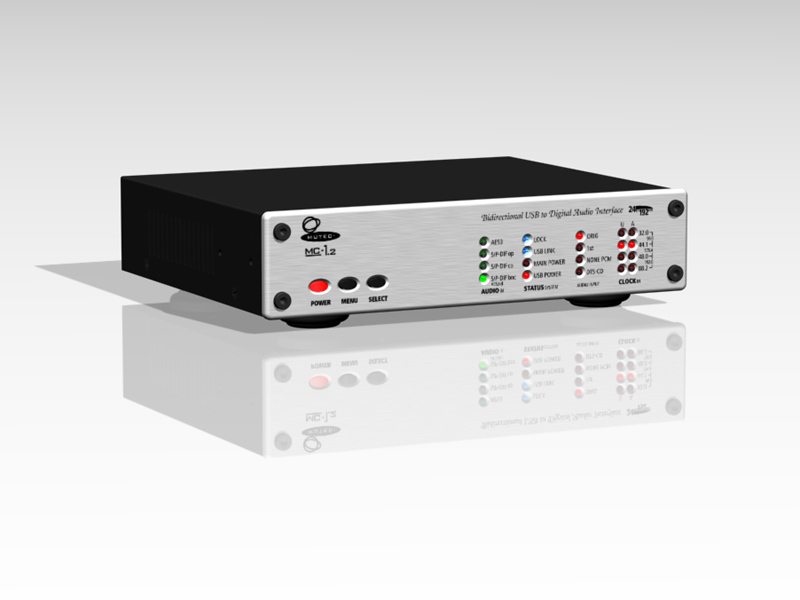 The MC-1.2 enables for the first time bi-directional conversions between USB audio streams and digital audio signals like AES3, AES3id and S/P-DIF. Therefore, the box does not only offer digital audio outputs, like most of the others, but also a full set of digital audio inputs for AES3, AES3id and S/P-DIF with BNC, RCA and optical interfaces. 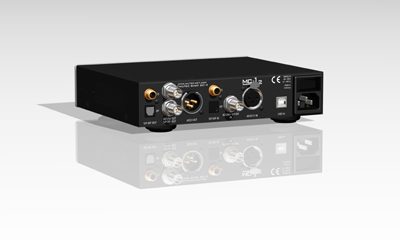 Signals received at the USB port are converted to five digital audio outputs simultaneously, which allow the connection of multiple receivers at your computer. 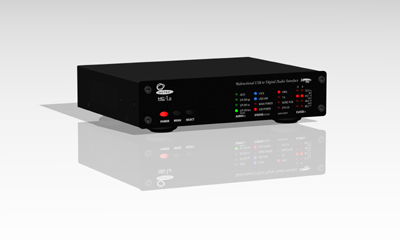 When selecting one of the digital audio inputs, the signal received is converted to an USB audio stream and sent into your computer. 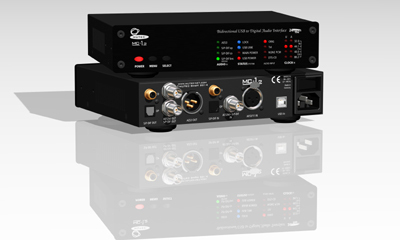 Both signal paths are able to work at the same time, presupposing equal sampling rates. This enables e.g. 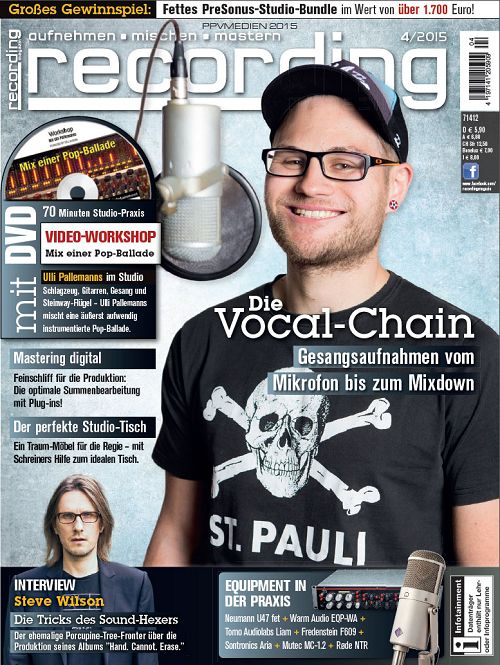 the simple connection of effect processors to your computer or the use of recording-equipment, whereat monitoring of recorded signals is possible through the computer during recording. High-End DACs or music servers often use BNC interfaces for S/P-DIF transfers, which is from an electrical point of view surely the best choice. With the MC-1.2, you can convert USB audio streams of every PC or laptop into the S/P-DIF format and output that through BNC interfaces to drive High-End equipment easily. This can be done while having four further outputs available to feed e.g. digital headphone amplifiers or other devices for convenient listening. It is known, that USB interconnections, respectively the transfer of digital audio via USB let most of the DACs not sound best. That actually applies also for higher-priced DACs. Using the digital inputs at DACs often results in a better sound. 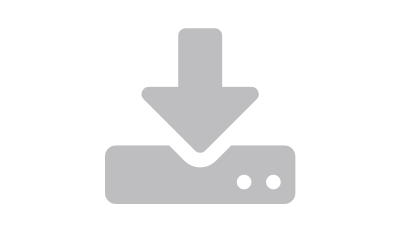 At this point, the MC-1.2 comes in and may help to convert your USB audio streams best possible and to connect your DAC via its digital audio inputs correctly. Additionally, by using latest USB streaming technologies, low jitter audio clocks and ultra-low noise circuit designs, the MC-1.2 is able to regenerate and improve the converted audio signal in a way that connected DACs usually sound better as when fed directly through their USB interfaces. Based on the MC-1.2's ability to work not only USB bus-powered, but also to use its own internal power supply, an isolation between the different power supplies for the digital audio and the USB part of the circuit is the result. To further improve this separation, the different areas of the circuit are supplied independently from each other by ultra-low noise power sources with carefully dimensioned external circuitries. Thereby, the transfer of distortions from the USB stream into the digital audio part can be reduced to an absolute minimum. That helps to improve the audio performance of the converted digital signals significantly. 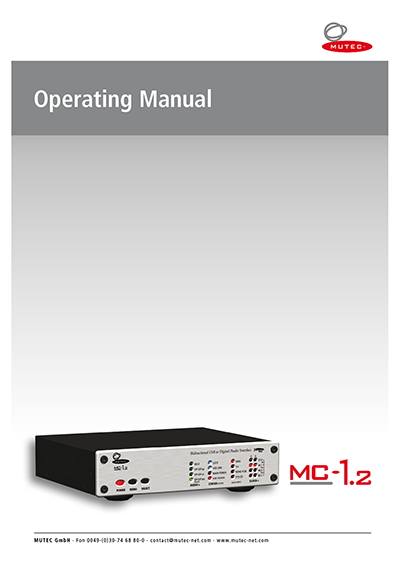 The already outstanding flexibility of the MC-1.2 is additionally increased through the ability to run the unit with its internal power supply for stationary use, or alternatively powered only through the USB interface during e.g. mobile events. Both states are displayed by LEDs on the front panel. The MC-1.2 comes in a matt-black, rugged steel case with anodized aluminum front panel. Regarding the front panel, you can choose between an aluminum- or black-colored version during purchase. Custom-designed case feets, which include soft rubber rings to prevent unneccessary vibrations, are standardly supplied to use the MC-1.2 as desktop device. For rack-mounting, the feet must be unscrewed and optional rack angles are mounted on the right and left hand of the case. "Overall the MUTEC MC-1.2 is a big upgrade to my USB dac and well worth the investment. If you are considering upgrading your dac via a bridge the MC-1.2 should be right at the top of your buy list." "Dear MUTEC team, here's my short feedback about the MC-1.2: I've been using the interface for a couple of days now and I'm absolutely stunned. I wouldn't have thought that a high-end USB interface could improve the sound performance of my audio chain (consisting of a Microsoft Surface with Win 8.1 -> Foobar via the MUTEC ASIO driver -> MUTEC MC-1.2 -> Sonic Frontiers SFD-1 DAC -> Stax SRM-323S -> Stax SR-407) to such an extent! You've ticked all the boxes with this interface. 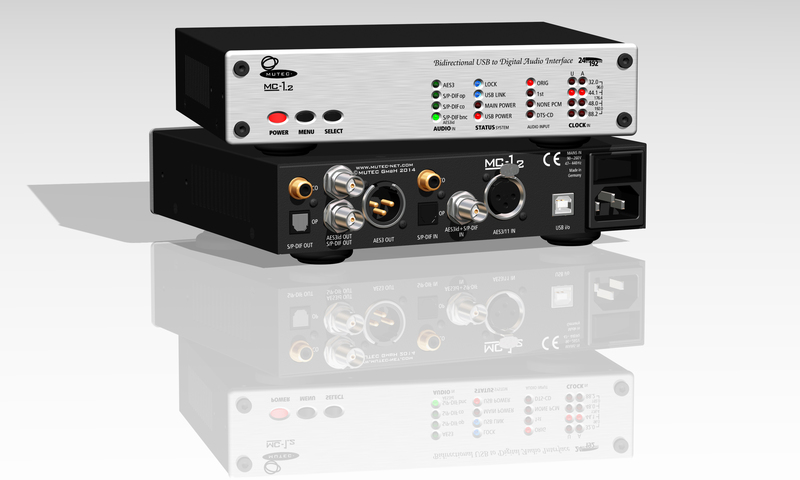 Thanks a lot for this great product ;‑)"
"The MC-1.2 USB-Interface alone was better than any other SPDIF I was able to look at, which didn't hit the level of Berkley Alpha USB ( $1,895 USD retail), but most of the ones below. Add the MC-3+ and there was no contest the combo was hands down better."